How to clean diamonds at home - tips to clean your diamond jewelry yourself and save money! When you wear a diamond engagement ring every day, it can quickly start to look scuffed and lose some of its sparkle. Dust can build up on the surface of the gemstone, and oils and dirt can become lodged in the setting. Over time, this can make your ring appear dull. The same can happen to a diamond necklace, bracelet, pendant, or earrings. Is there a way you can clean your diamond jewelry safely and effectively at home? As it turns out, yes you can. There may be times when you need a professional, but you can take care of the majority of cleaning and maintenance tasks for your diamonds on your own. 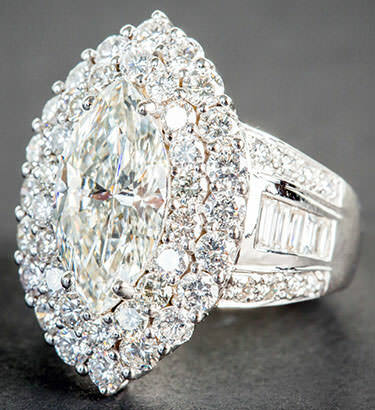 Marquise cut diamond halo ring – engagement rings need to be regularly cleaned. Avoid strong household cleaners, especially those which contain harsh chemicals like chlorine, bleach, and acetone. These products are bad for gemstones as well as their metal settings, and can damage your diamond ring or other diamond jewelry. Steer clear of abrasive cleaners as well, such as baking soda or toothpaste or anything with a powdery texture. I have come across how-to guides that actually advise you to use baking soda, but don’t even think about it! Abrasive cleaners can scratch metals. If you have a gold ring, it will be particularly prone to damage. Gold is a very soft metal, and the purer it is, the more likely it will be that baking soda or another abrasive cleaner will scratch it. Do not use ultrasonic cleaners. Ultrasonic cleaners are an alluring solution because they are fast, easy to use, and effective for certain types of jewelry, but they are often a bad idea. Ultrasonic cleaners utilize vibrations to do their cleaning work. 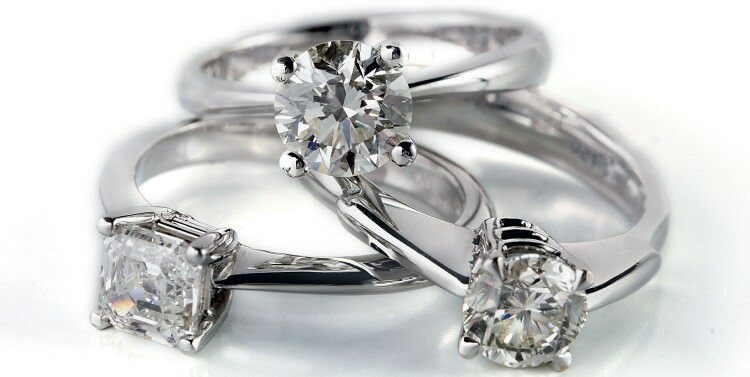 If you have a delicate ring with prongs, it is easy for an ultrasonic cleaner to shake loose a diamond. With other types of settings, you may be able to get away with an ultrasonic cleaner, but it is best to ask a professional before attempting this. Here is how you CAN safely clean your diamond jewelry at home! Stackable diamond rings – how to clean diamonds at home. A mild ammonia-based detergent; dish soap works great. Start by closing the drain to your sink. Dropping diamond rings down sink drains is such a ubiquitous mistake that you probably know someone at some point who has done it. Your ring is precious; this is the last thing you want! Next, fill the sink with warm (not hot) water. Alternately, you can place a bowl inside the sink and fill that with warm water (this is what I would advise—it is just one more way to keep your ring away from the sink drain). Add your dish detergent to your warm water. You do not need a lot! Stir the water and the soap to distribute it. Drop your ring (or other diamond jewelry) into the warm water and dish soap solution and wait 10 minutes, allowing it to soak. You can try soaking for longer if necessary. You may need closer to 20 minutes, depending on how stubborn that dirt and grime is. Next, get your soft-bristled toothbrush and start brushing away the dirt. The soft bristles should be sufficiently gentle not to damage the setting of the ring, but be careful, especially if your ring is set in high-karat gold. Make sure you get every side from every angle, and put special effort into cleaning the back of the diamond. This is a key area which effects sparkle. If you can get it clean, you can do a great deal to restore the sparkle and shine you are looking for. Submerge the diamond again and swirl it around in the water. This will help get rid of even more dirt you managed to loosen up with the toothbrush. Rinse your diamond under warm running water. Double check that the drain is closed before you do this! This is the step where you are most likely to lose it! Take a look at your diamond. Does it still have some grime on it? You may need to repeat the process once or twice. If necessary, soak for another 10-20 minutes, scrub the diamond, swirl and rinse it again. You can try lengthening the amount of time you soak the diamond if you did not get the results you were hoping for the first time. Once you are satisfied that your diamond is as clean as you are going to get it, allow it to air dry. If you must dry it by hand, do so carefully using a lint-free cloth. Make sure your diamond jewelry dries completely. Polish your jewelry. To restore even more of your jewelry’s original shine, you can use a polishing cloth to buff up the metal. Only use a polishing cloth specifically designed for polishing jewelry! Anything else may lead to scratches. Remember to be extra-gentle if you are polishing high karat gold. You usually do not need to rub hard to get rid of oxidation. Examine your jewelry again. Carefully check prongs and other setting elements to ensure that nothing has been loosened by the cleaning process. If anything has, take it in for a quick repair right away so that nothing falls out or breaks. If everything is intact, congratulations, you did a great job! 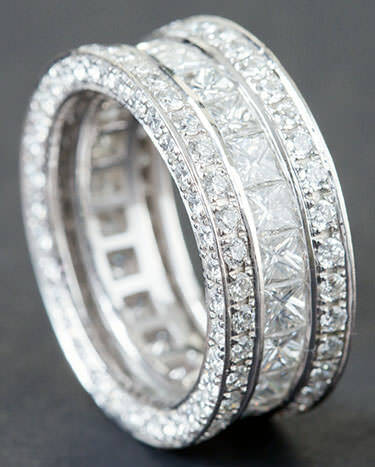 Have some stubborn dirt or debris stuck between the prongs and the diamond, or inside grooves in the metal? You can use a toothpick to carefully dislodge these particulates without disturbing the setting. As with every aspect of this process, this is something you must undertake with care. A dental water jet may also be used. Try to avoid overly hot water, especially if you know that your diamond has a crack or inclusion. A sudden change in temperature can cause the crack to expand, which can break your diamond or weaken it even more. I have seen some sites advise that you use very hot water to wash your diamond, but this is the reason I feel this is not for the best. Warm water should be sufficient to get the job done. If you feel you must use hot water, first run warm water over the diamond to heat it up. That way when you put it in the hot water, the temperature swing will not be so extreme, and you will be less likely to damage the stone. If you have a tough job, you may need to get a professional to help you clean your diamond. And if your diamond jewelry is damaged or weakened already, you should probably get it repaired before you attempt to clean it on your own. How often should you clean and polish your diamond jewelry? There does not seem to be a strong consensus here. There are women who wash their wedding rings every other day, but there are also those who wait months before they do it. How often you need to clean and polish your diamond jewelry depends in large part on what you expose it to. If you expose your ring regularly to a lot of cosmetic products (hairsprays, hand lotions, nail polish, etc.) or to dirt and grime, you may need to wash it frequently. If not, you may be able to get away with doing it less often. For most people, once every 2-3 weeks is probably sufficient for keeping a diamond clean and polished, and that is assuming you wear it daily or regularly. If you have diamond jewelry you do not wear as often, you probably can get away with cleaning it a few times a year. In general, I would say that the less you clean your jewelry, the better. Why? You want to subject your diamond jewelry to as little stress as possible. One of the best things you can do to keep your diamond jewelry clean is simply take it off when it is wise to do so! Before applying cosmetics, remove your diamond jewelry and set it aside somewhere. If you are going to be doing manual labor—whether it is gardening or household cleaning or work in a garage or workshop—remove your diamond jewelry first. The less dirt, grime and chemicals you expose your ring to, the less dirty it will get, and the less frequently you will need to clean it. Plus, these are situations where it is best to remove your diamond jewelry anyway in order to prevent damage. Still, you should never hesitate to bring it to a professional cleaner if you think you need the extra care and attention of an expert!